La Donna del Lago, Rossini’s tale of rebellion in the Highlands, premieres at the Met. From the announcement last February that Joyce DiDonato and Juan Diego Flórez would premiere Rossini’s opera seria La Donna del Lago at the Met this season I knew I’d be there. Why would one miss a chance to witness arguably two of the finest singers of this era together again on stage singing a style of opera perfectly suited to their strengths? Especially when the opera was written by one of the all time great opera composers...here it is, home court. DiDonato as Elena is every bit the center of La Donna del Lago. Much like Cinderella, she, the Lady of the Lake, is renowned for her beauty but she also excels at hospitality, kindness, and loyalty, all strong virtues in my book. Consequently, Elena has many admirers and a whole chorus of friends who, at one point in the opera, drop over to her hut for a dram of single malt and a spot of haggis. She also has three men, not to say gentle men, who seek her affections. Elena therefore has a lot of duets and her fair share of solo numbers. It’s a plum role for a high mezzo. Like her Maria Stuarda, DiDonato’s Elena reveals more personality dimensions than one usually encounters in operas of this style. There are of course other singers who can get through the vocal challenges, but few can communicate the soul of their characters as well as DiDonato. Add to this her unique range of tonal qualities, from soft velvet to strong steel, and her agility…her final “all’s right with the world at last” aria Tanti affetti in tal momento is exquisite. DiDonato is, in a word, phenomenal. Brava! Juan Diego Flórez sings Re Giacomo V (King James) of Scotland, who, disguised as Uberto (Hubert), wanders about seeking the legendary Lady of the Lake. He falls in love with her, but she is plighted to Malcolm, a Scottish warrior, though Elena’s father wants her to marry Rodrigo di Dhu, known by his close comrades as 'Whoop,' the gruff leader of the Highland. 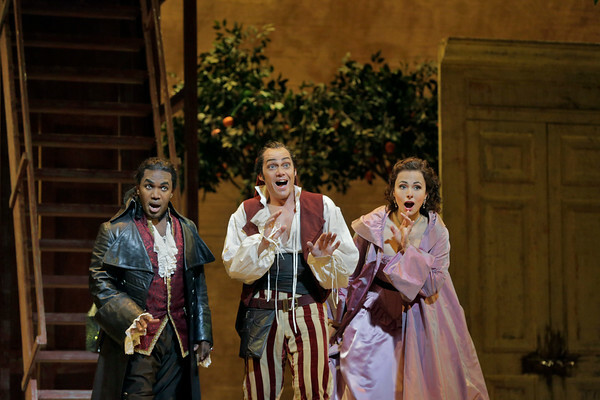 Flórez sings the fiendishly high tessitura of the role with aplomb, coloratura and all, and has longer scenes with DiDonato. Elena's affections are torn between two lovers, Giacomo and Rodrigo. Equally high is the role of Rodrigo, sung admirably by John Osborn. The role of Malcom is sung by a mezzo, thus giving Rossini the opportunity to write a duet for two female singers. Daniela Barcellona is a good match with DiDonato. There is ample work for the Metropolitan Opera Chorus, though they tend to travel in packs, thus transitioning the isolated banks of the lonely loch to the bustle of a Times Square in a heartbeat. 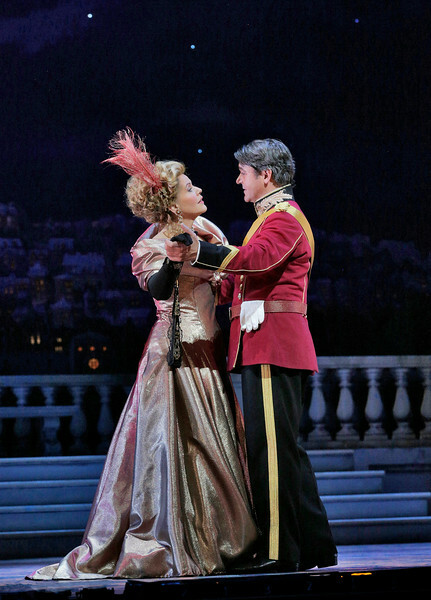 The Oath Scene is a case in point, as is the glorious finale of the opera. Michele Mariotti conducts the Metropolitan Opera Orchestra. He allows Rossini’s score to unfold rather gently, but adds muscle when needed. The scenes in this new production by Paul Curran, with sets and costumes by Kevin Knight, are rather cleverly changed by shifting floors, elevators, portable props, and sky projections designed by Driscoll Otto. It’s a small, relatively spare, but effective set. The rocky floor space is flanked by immense black walls, probably just there to hide the wings backstage and meant to be unseen. No doubt the HD cameras will stick to this perspective. And don’t hesitate because you don’t know La Donna del Lago. I’ll wager less than 1% of the audience knows La Donna del Lago, let alone has ever seen it on stage. But you probably know La Cenerentola and perhaps you even had the privilege of hearing DiDonato and Flórez in it last season. Though a serious opera, Lago is stylistically closer to Cenerentola than it is to a serious opera by any other composer. It’s another chance to relive the magic. For the record, La Donna del Lago is scheduled for next season as well. Review performance date: February 25, 2015. Be advised: the performance’s running time is about 3 hours 15 minutes, including one long intermission. The first act is about 95+ minutes. Plan accordingly. Иоланта and A Kékszakállú herceg vára at the Metropolitan Opera in February. The Metropolitan Opera’s double bill of Tchaikovsky’s last opera Iolanta and Béla Bartók’s only opera Bluebeard’s Castle is by all means a must-see event. Although the experience of sheer joy as the curtain falls on the final chorale of Iolanta is completely negated by the somber gloom and suffocating ending of Bluebeard’s Castle, the emotional journey stays with you, making for a quietly reflective ride home. At least there’s time at the intermission to celebrate. The new production by Mariusz Treliński links the two tales dramatically, thematically and, to an extent, scenically. Men of power, Iolanta’s father King René and Judith’s new husband Duke Bluebeard are both hunters, both linked by a glove on the hand. This is more graphically evident in Iolanta in the opening sequence and later when a stag is brought in, hooked and drained, if more inferred in Bluebeard from the trophies on the wall. They are oppressors of their women; they are also murderers, psychologically, physically or both. This should not be surprising, given the plot of Bluebeard’s Castle, but isn’t Iolanta after all a happy occasion: King’s daughter now can see a wedding in her future, no pun intended. However Treliński and dramaturg Piotr Gruszcyński suggest that Iolanta’s blindness is probably not her only problem here. The King may have darker reasons for keeping her isolated from all others, silencing the servants and threatening death to all trespassers. Who visits Iolanta’s bedroom during the prelude? And who is left standing joyless as the joyful chorus leaves the celebration on stage at the curtain? Other features of the staging warrant mention: Boris Kudlička’s sets and Marc Heinz’s lightings are effectively dark and nightmarish, particularly the trees and vine work that descend on Iolanta’s remote enclosure at times. Her ‘room’ rotates so that indoor and outdoor scenes can be changed seamlessly. Bluebeard’s castle is cold but more industrial and open, less constricted and drippy stoned than the music suggests. At least there are enough scene changes to add motion and a variety of menace to keep one’s attention throughout. These are enhanced by video projections (Bartek Macias) and Halloween type sound effects (Mark Grey). Happily, not a word that comes quickly to mind when discussing Bluebeard, this attention to detail and atmosphere make this Bluebeard a far cry from the dark blue basically unchanging visual-dramatic vacancy of the previous Met production with Sam Ramey and Jessye Norman in 1989. Iolanta is cast to strength: Anna Netrebko is in excellent form vocally and dramatically (as evidenced also in her newly released recording of the opera on DG (see OM’s page Opera Recordings). Iolanta is a big role, right up there with Tchaikovsky’s Tatiana, Joan, and Lisa. Here the direction is tighter; Netrebko is focused every moment. Brava Anna! As Vaudémont tenor Piotr Beczala matches her in a robust love duet, preceded by a sentimental little aria. 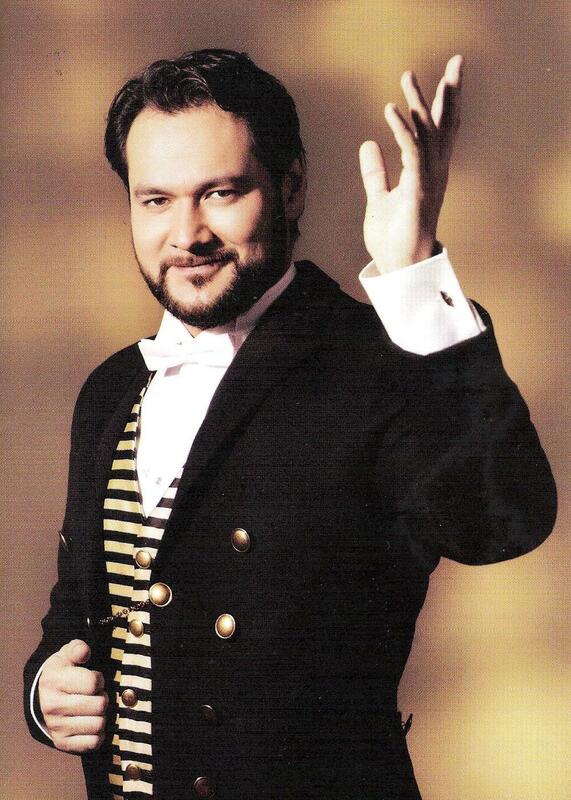 Baritone Aleksei Markov (who also appears with Netrebko on the new recording of Iolanta) is a strong Duke Robert. Both the duet and two arias were soundly applauded, as they should be. Ilya Bannik sang the role of King René in my performance, replacing Alexei Tanovitski, who was indisposed; Elchin Azizov is a moving Ibu-Hakia, the physician/philosopher who, with the help of love and Allah, cures Iolanta. The spoken prologue to Bartók’s Bluebeard’s Castle raises the question “where is the stage: within? without?” The age old drama of a spirited, young lover who is ‘bought off,’ silenced with jewels by her immobile, impenetrable man is right in front of you on stage or, if you zone out a bit, it now plays out in your reverie, probably resonating in part of your collective unconscious. Bartók’s music is achingly beautiful and truly unique, arguably one of the greatest operas of the 20th century. Easily one of my 100 top favorites. Apart from their differences Bluebeard and Judith might have made a handsome couple. Judith is 'delivered' by his driver, as if just back from, maybe, their wedding reception, though her blue gown more suggests an urban cocktail party. He's come back earlier, his tux is askew from digging what will be her final resting place. Come inside. But hardly through the door she approaches him, he avoids; he comes menacingly closer, she cowers. Nadja Michael’s Judith is seductive, seemingly more eager to make the relationship work, despite all signs to the contrary from her smoldering but somber man. She wants to bring light into Bluebeard’s darkness, despite the rumors that there were others before her who had come to harm; Michael’s voice is a unique combination of a strong upper range and a deeply low end; her lithe body begs for a steamy bath, then later a white robe, like that of a virgin to be sacrificed. Michael is riveting, sensual, and frightened, enhanced by her many supple postures. Mikhail Petrenko’s Bluebeard is virile, if also moody but he is ultimately closed off emotionally. He almost responds to Judith’s ardor, even asking her to kiss him…were it not for her insistence on opening all of the doors to his being. Petrenko is young enough to make her efforts and reactions plausible. Valery Gergiev leads both operas. OM’s review used the words ‘mannered’ and ‘more measured’ to describe his sound picture of his Iolanta on Philips CDs. For the most part he stands by that approach here at the Met. He brings an unfolding beauty of it all, never rushed. Gergiev’s read on Bluebeard’s Castle is to lower the dynamics and stress the more subliminal, dreamlike, sometimes nightmarish aspects of the score; the orchestral sound flows like the Rivers Acheron and Lethe, ultimately more engrossing and penetrating. Close your eyes at times, go under with it. Let it seep in and disturb you. It should. This double bill is the Met at its best! Review performance date: February 3, 2015. Be advised: the performance’s real running time, as opposed to what’s posted, is about 3 hours 45 minutes, including one very long intermission. Not a date opera...but make it special and keep it cozy. Snow is pretty until it’s not.